My quest to grow grapes worthy of making great wine caused me to be willing to experiment and take risks. The biggest risk was deciding to try and grow some vinifera vines when I planted my vineyard. Although everything that I read and researched told me I couldn't do it because of my winter lows and too short a growing season, I tried anyway. I did a lot of research and found what I determined to be the only red bordeaux grape that had a chance here: Cabernet Franc. 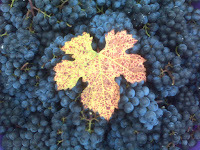 It is one of the three main grape varieties that comprise a classic Bordeaux wine or an American Meritage(the Bordeaux style but grown in the U.S.) along with Cabernet Sauvignon and Merlot. It is actually a genetic parent of Cabernet Sauvginon along with Sauvginon Blanc. It produces a much less tannic, lighter red wine than Cab Sav and a bit more herbaceous in character. It generally makes up the smallest percentage of the Bordeaux stlye blend. The best ones however, can be excellent and there are parts of the Loire Valley in France where it is the primary part of the blend. 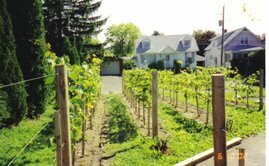 I have had some excellent "old world" style Cab Francs as a single varietal wine from the Long Island and Finger Lakes regions of New York State, as well as some more "fruit forward" New world style Cab Francs from California. I like them from both coasts for their respective characteristics. The variety just happens to be the most winter hardy of all vinifera varieties. It can survive well between -5 and -10F with minimal bud damage and the vine will not be killed until temperatures drop lower than -16F. It also ripens earlier than many red wine varieties including Cabernet Savignon. My only concern was that weather records showed a -28F record low for my City in upstate New York. I was hoping to achieve something along the lines of the Long Island versions since I liked them the best. My climate here is closer to the Finger lakes in the winter, but Long Island in the summer with the big exception of the fact that there is no large body of water near me to lengthen the ripeneing period by moderating temperatures in the late fall, when the water holds some heat and delays the first killing frost for a couple of weeks. I had read that some growers in places like Minnesota take their vines down off the trellis and bury them under a layer of dirt due to winter lows that prevent the growing of fine wine grapes. I figured hey it's only five vines, these guys are burying hundreds or thousands. No problem! And it wasn't, the first year. It didn't take me long at all an hour or two maybe. The vines came through with flying colors. Then I had a great idea; I was struggling to keep ten of the original vines I planted healthy. The variety was Chancellor another French-American hybrid that was very susceeptible to fungal diseases. So I ordered 25 more Cabernet Franc vines and in the spring I ripped out Chancellor and replanted with the Cab Franc. They grew nicely but pruning them down and burying them now that there was 30 was a lot of work. I did it for three years and as the vines got bigger, it got even harder. There was also the problem of a very short window of opportunity between leaf drop in late October/early November and the time the ground froze solid in mid-December. Especially when you only have weekends to get it done. 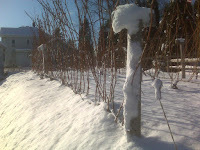 The coldest temperature I have recorded in my backyard since I planted my vineyard is -17F. Fortunately I had the vines burried that year. But there have also been three years when the temperature never dropped below zero. The bottom line is I have stopped burrying the vines. Instead, I have devised a riskier but much easier method. 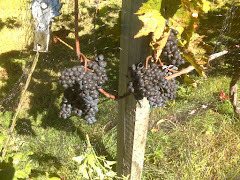 I leave the vines up on the trellis and do what is done in the Finger Lakes - I "hill them up". Basically I mound up dirt around the base of the vines over the graft union. That is where the "Cab Franc wood" is grafted to the rootstock. This way if the worst happens and the whole vine is killed by low temperatures, you can regrow from the ground up. Then I take it a step further. I also let the vine grow a sucker each year, which is basically a shoot from the base that could be another trunk. Since the shoot is so thin and flexible it is very easy to bend down and pin to the ground before winter. If winter temperatures don't cause any damage, I'll just prune it off in the spring and grow a new one for next year. After "hilling up" I blow any snow from my driveway throughout the winter, onto the vines to add a layer of insulation to the vines for further protection. Is it a perfect method? No, but so far I have had a full crop every year. There is still the possibility I could have 100% kill of everything exposed to cold air if the temperature drops low enough, but that's where the extra shoot/trunk will come in. It will at least give me a small crop the next year and a full crop the year after. So far my risk has paid off. I better watch my tongue, it's only January! Not bad for our frosty and unforgiving climate Huh? The wine tastes great so far, but we'll know better in about six months. I'm very excited though, maybe I'll be the first person to make a good red vinifera wine in the Capital Region of New York State. Now that would be something. I think you took the risks you had to take, because you must take some ones when you want to grow as a person or to achieve some goals. If you like to produce wine I just can wish you good luck in the business. You Choose to grow grapes and get high Quality wine and that's important, specially because american wines are excellent, and must be appreciated. I never imagined the work behind a Glass of Wine. All the care the vine needs and because of the waether, Bugs and oxigen, Wow. Just post a little more about your experience... I like to read about someone who's doing what I want to do.. make my own wine!!! If you ever want to take some of the load off, I'd really like to write some content for your blog in exchange for a link back to mine. Please send me an e-mail if interested. Thanks!